On the Tarmachans and Ben Lawers a system of tunnels and aqueducts collects water and diverts it into Lochan na Lairige. The massive buttress-type dam is 344m (1128 feet) long and 42m (138 feet) high. 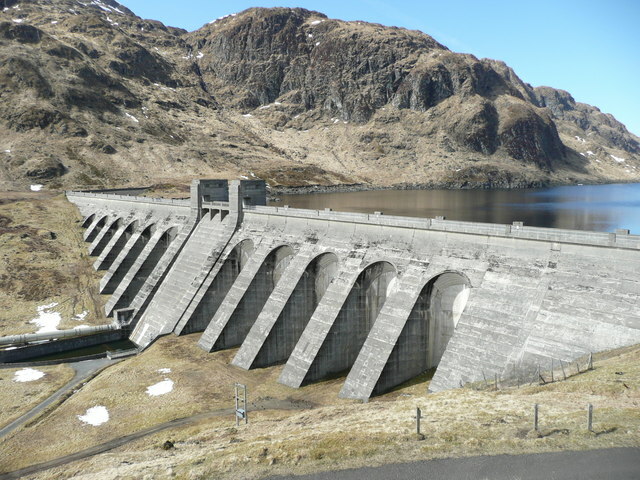 Water descends through a pipe, visible on the left, a vertical distance of 415m (1361 feet; the greatest drop of any Scottish hydro-electric scheme) to Finlarig power station on the shores of Loch Tay. Cycle down the dam? Here's how!